Britain is home to fifteen species of breeding birds of prey, from the hedgerow-hopping Sparrowhawk to the breathtaking White-tailed Eagle. 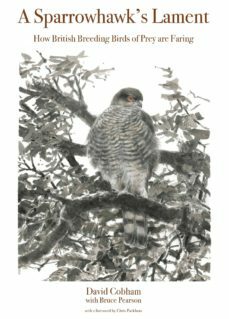 In this handsomely illustrated book, acclaimed British filmmaker and naturalist David Cobham offers unique and deeply personal insights into Britain’s birds of prey and how they are faring today. He delves into the history of these marvelous birds and talks in depth with the scientists and conservationists who are striving to safeguard them. In doing so, he profiles the writers, poets, and filmmakers who have done so much to change the public’s perception of birds of prey. Thanks to popular television programs, the Victorian myth that any bird with a hooked beak is evil has been dispelled. However, although there are success stories--five birds of prey that were extinct have become reestablished with viable populations--persecution is still rife: so much so that one bird of prey, the Hen Harrier, became extinct in England as a breeding bird in 2013.Featuring drawings by famed wildlife artist Bruce Pearson, this book reveals why we must cherish and celebrate our birds of prey, and why we neglect them at our peril. In A Sparrowhawk’s Lament, you will learn how the perfection of the double-barreled shotgun sounded a death knell for British birds of prey in the nineteenth century, how the conscription of gamekeepers during two world wars gave them a temporary reprieve, how their fortunes changed yet again with the introduction of agricultural pesticides in the 1950s, why birds of prey are vital to Britain’s ecosystems and cultural heritage – and much more.